Découvrez la fameuse Vallée Sacrée des Incas du Pérou à bord d’un quad 4x4. Quittez Cuzco pour Cruz Pata, où vous monterez sur votre véhicule tout terrain pour partir à travers la campagne, négocier des flaques de boue et des pistes montagneuses jusqu’à Moray, un site archéologique inca aux immenses ruines circulaires qui étaient autrefois consacrées à l’agriculture. Passez un peu de temps à explorer le site avant de poursuivre votre aventure vers les Salineras, une impressionnante série de mines de sel située au pied d’un imposant canyon. C'est une toute nouvelle manière de découvrir les hauts plateaux des Andes. When we were supposed to go on that tour, there were some local strikes and roads were barricaded. The agency offered us a different tour instead, and it was very interesting. 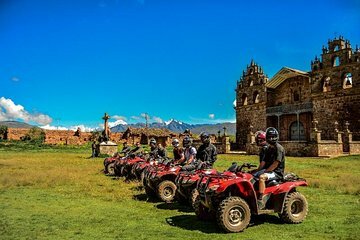 Cusco and sacred Valley are such beautiful places, that I am sure quadbike tour would have been a great experience! The guys running the tour were very professional, helpful and knew what they were talking about. I was very impressed with the area, salt mine and the tour. Great day out. On the day we had the option of either visiting an Inca site or see more of the countryside. We opted for the countryside route. It took us to a lake and through little villages. First time on a quadbike and it was incredible fun. Scenery was stunning. Guides on the day were great however one of the operators at Bamba HQ in Milhouse hostel who the tour was with was a little rude to me. Other than that, all was fantastic. Fun day out. Just bring clothes you don't mind getting covered in dust! Tour was late picking us up, but still made it out and back on time. Our guide catered to our wishes, since we had already seen 4 archealogical sites, he recommended we go out to a lake for photos and the scenery. The salt mines were amazing, can't believe all the work that goes into making salt! 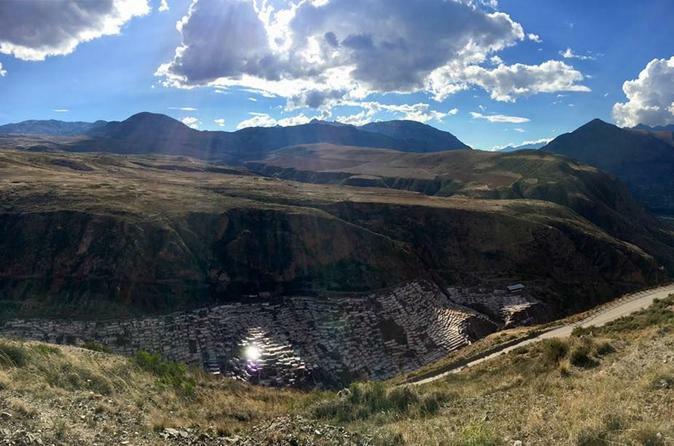 You don't stay long at the mines but the draw is definitely riding the ATV through the country side with the beautiful Andes mountains in the background. This tour was really good. We had a short practice on the 4wd bikes and then went for a site seeing ride. The salt works was interesting and we got to see beautiful landscapes. All safety equipment was provided. At the end we were able to enjoy some local beers. Very friendly staff. Tour was okay. Did not get much information about sites visited. It was more a photo opportunity. OMG! Unbelievable tour and guide. Beautiful scenery--great way to spend the day. If you are looking for something a little adventurous while in Cusco this is the trip for you. It was a great way to see the valley and some of it's sights! Pros: plenty of time spent on the bike - you definitely get your money's worth, beautiful scenery, enjoyable trip, easy for beginner drivers. Cons: our pickup was 30 minutes late, it takes two hours to get from Cusco to the Sacred Valley which was a little too long in our opinion - by the time you get back you've spent 4 hours in a car, our group was all spanish-speakers except for us so our guide catered to them - we got super abbreviated descriptions of our stops due to the language barrier, both sites visited required an extra fee paid in cash when we arrived - they should seriously just be included in the total cost, the sites are cool to see but you're not actually at the salt mines - you just stand on a hill overlooking the mines way down in a valley below - kind of a ripoff to even have to pay for that. Overall: We did enjoy this excursion, but it wasn't an ideal value for money. Not five star-worthy. This was sooooo much fun!!! I was really nervous since I had never driven a 4x4 before but the guides are very helpful within 10mins I was very comfortable with driving. the scenery is amazing such a beautiful trip!! I was in cusco for 2 weeks and this was the funnest thing I did by far!